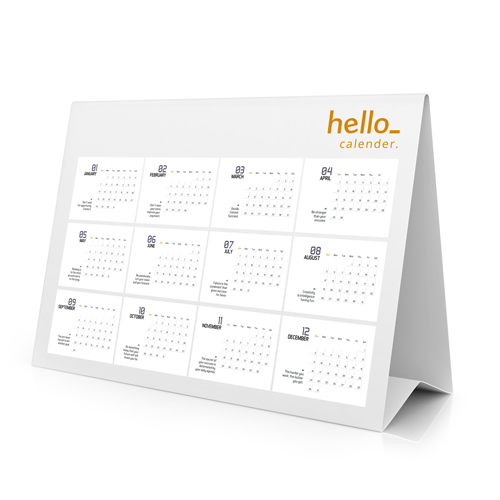 Order Folding Calendars from Helloprint: cheap, convenient & easy! The folded calendars from Helloprint show you all the days and months of a year in one calendar. They are great to have on your desk, as well as to send out or give away to your customers. The folded calendars are easy to fold into a pyramid shape, so the calendar stays firmly in place. Please note: Calendars do not come with a preset month and date design, this needs to be included in the submitted artwork. A folded calendar is a paper sheet which can easily be folded into a calendar (pyramid, freestanding form). For the delivery of your folded calendars we use multiple carriers. Because of the highest reliability, in most cases we use UPS or DPD. The folded calendars that is chosen in most cases can be selected via our website. How are the calendars being folded? The calendars have fold lines, so the calendars can be easily folded into the right shape. The calendars are also supplied with an adhesive strip, so both ends can be put together firmly. Does the calendar come with pre-filled design, including months and dates? No, the months are not printed on the calendars automatically. You have to put them on the design-file yourself.